We have been snowed in for four days now, with the exception of the perilous trips to Jack in the Box, Five Guys, and Buca Di Beppo, so I felt it was time to make meatloaf. Meatloaf was the only thing my mother made that I can truly say was good, and that was because she followed the recipe on the Quaker Oats box precisely. She even made a recipe card for it, suggesting at least for a moment that she enjoyed cooking. Now I may run into some opposition from the macaroni and cheese contingent, but I think the only sides you can serve with meatloaf are mashed potatoes and peas. Homemade mashed potatoes, of course. My husband says the only reason I make meatloaf is so I can have meatloaf sandwiches the next day. He’s right. Perfect meatloaf sandwich: meatloaf, mayonnaise, salt, pepper, iceberg lettuce and soft bread – no variations. The best thing about meatloaf is that it’s kind of like a casserole. Add what you like and leave out what you don’t. The recipe that follows is for the grill. It gives the loaf a nice smoky flavor. But seeing as how there is four inches of snow on the deck, I’m baking mine in the oven tonight. Three hundred and fifty degrees for an hour. Mix all the ingredients, except the slices of bread, thoroughly. Clean hands are your best tools here. Line a baking pan with foil and put a grate (the kind you would use to cool cookies) on top of it. Put enough bread slices to cover the base of the meatloaf. The bread will soak up the grease. Shape the loaf and put it on the grate. Place meatloaf on grill and insert a probe thermometer about halfway into the loaf. Cover the grill. Cook until the meatloaf reaches an internal temperature of 160 degrees. Check about halfway through and if the meatloaf is getting too brown on top, cover with foil. About 10 minutes before it is done, baste with barbecue sauce. okay, why was it you didn’t adopt me? i mean besides the fact that we are almost the same age. 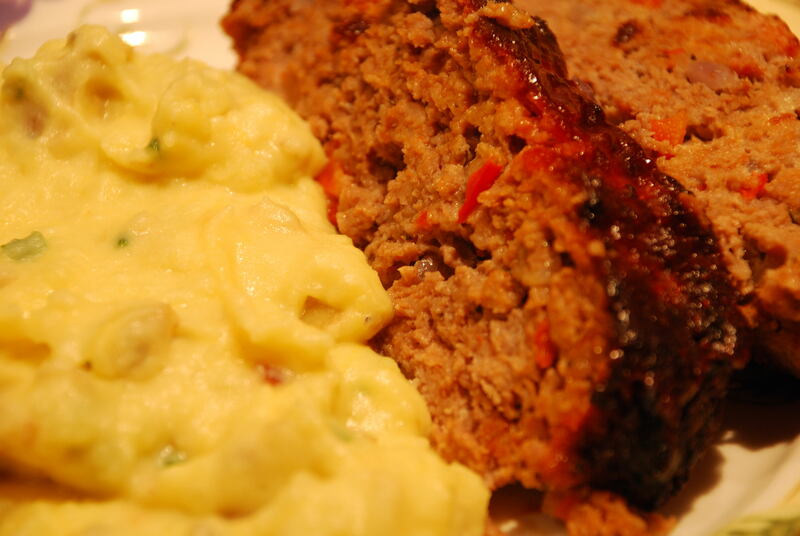 meatloaf…..yum. never tried to grill it, but i will now. I couldn’t get Noah to agree to a big sister. Other than that, you would have been in. i’m sure he would be good with it now. it’s never too late you know. by the way, your grilled meatloaf makes for great leftovers. yeah, the meatloaf sandwich was yummy. but the shepherds pie…..excellent.